If you’re a parent, you know that there will be situations wherein your child will not be able to attend school. However, no matter what that reason may be, if the school is not informed of the child’s absence, then you shouldn’t expect them to just let it go without any consequences for your child. 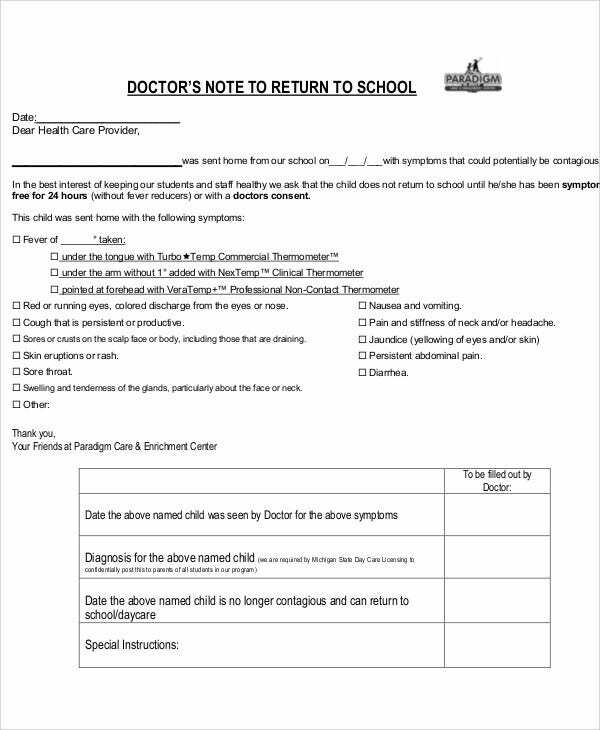 You may also like doctor’s note template for school. So to ensure that you’re child’s teacher is at least informed about the absence, you’re going to need to come up with a proper note that contains the specific reason as to why your child cannot attend school. This article will focus on how you are going to go about creating this type of note. If you were a teacher and you see that you have a couple of students that are missing from your class, then the first reaction you would have would no doubt be in concerns as to why you weren’t informed about their absences. 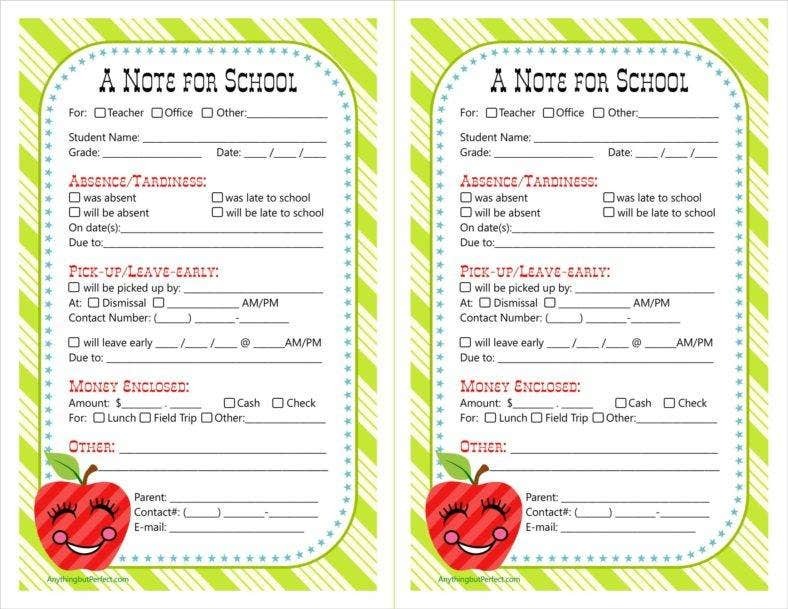 So by creating a school note, you’re able to provide the reason as to why your child will be absent and the date or dates in which your child will be unable to attend his/her classes. When a teacher sees that there’s an empty chair in his/her classroom and there’s no proper reason as to why that is, then the teacher may assume a number of things. He/She might think that the student is cutting classes while doing delinquent-like activities. So to prevent that from happening, you’re going to have to send your child’s teacher a note. Whenever you’re providing the reason for these school notes, you have to make sure that you’re really specific and you also have to provide all the information the teacher is going to need so that he/she understands why your child could not attend classes. You may also like school cornell notes. In a workplace, there are attendance policies where if an employee fails to show up for work within a specific number of days and has no valid excuse for the absences, then he/she will be let go from the company in accordance to the terms of the policy. It’s sort of the same thing in schools where if the student fails to come back and attend classes within a certain period of time, then the teacher may mark the student as someone who may have potentially withdrawn from the class. 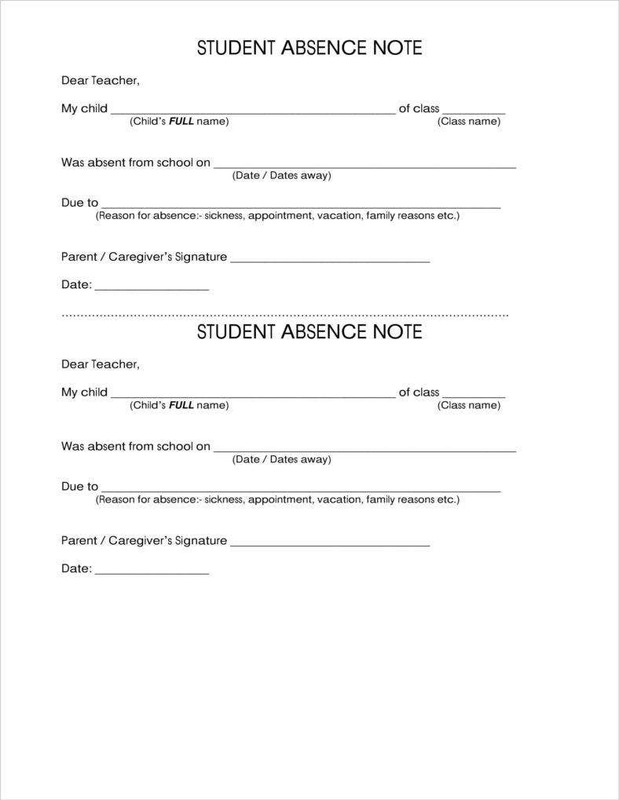 So to prevent your child from having bad marks on his/her attendance record or his/her entire school record, you’re going to have to take responsibility and create a note stating the purpose of your child’s absence. If your child were to take a hefty amount of time away from school, then there would be a number of important things that he/she may have missed in terms of lessons and activities. This can end up being a big problem as your child will fall behind the rest of the students and he/she may not be able to pull up the grades to pass the classes due to the lack of knowledge or participation in quizzes and activities. So by sending your child’s teacher a note, you can give the teacher a heads up on when your child will miss classes. Doing so will give the teacher time to prepare for all the materials needed that will allow your child to make up for all of the school time missed. You may also see simple note templates. 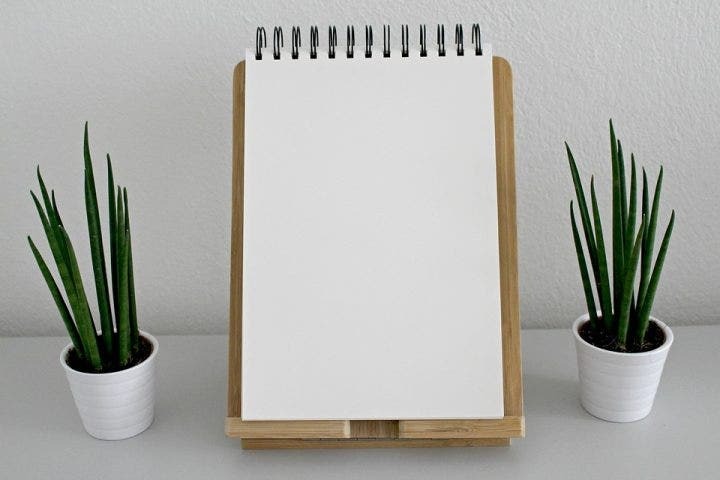 As stated before, the entire point of creating a school note is so that your child’s teachers will be able to know why your child will not be able to attend classes and the date or dates in which your child will not be able to attend them. If you’re able to come up with a not that has a viable excuse, then it’s very highly likely that your child’s teaching will understand and even support your child once he/she is able to return to class. You may also see simple note templates. When you’re creating the note, you want to make sure that there are no errors. If you think that you need the help of a spellcheck software or app to help you spot any mistakes, then go and get one as soon as possible. There are some parents who make common mistakes such as misspelling a word or two and thinking that it’s not such as big deal. How a parent properly spells out words can help provide the image the teacher on the kind of person that’s raising the student. You want to make sure that the teacher knows that you’re a competent parent who knows how to raise a child. So, go through your entire note and if you see any spelling mistakes that need fixing. You can have a friend help you spot these mistakes if you think that it’s necessary. You may also like nursing notes. This is just as important as making sure that you don’t have any mistakes in your spelling. While you can still have bad grammar yet make things understandable, it’s always best that you go with what’s right. Just like with your spelling, your grammar will give your teachers the image of the kind of person and parent that they’re dealing with. So any misuse of pronouns, forgetting to place a period at the end of a sentence, not capitalizing the first letter of a name and other grammar errors are ones that you cannot allow and you’re going to have to fix them as soon as you’re able to spot them. To prevent having any grammar mistakes on your note, all you have to do is take your time when making it. Gather all of your thoughts and think about everything that you want to say. If you think that you’re having problems in terms of grammar, then you can always use online tools or apps to help you out. Just make sure that you have little to no grammar mistakes. You may also like sample note templates. Again, you want to show the teachers and the school that you’re a competent parent and that you’re one who shows respect and is also capable of raising your own child well. So when you’re creating the note, you’ll have to keep its tone as respectful and courteous as possible. Simple courtesy begins with addressing the teacher by name, followed by a warm greeting, and the carefully explaining the reason for your child’s absence. Also, don’t forget to thank the teacher for going through your note and provide a statement stating that you hope he/she understands. You may also like teacher thank you notes. Try to keep the note as short and as simple as possible. You don’t want this to be too long as teachers have other things that they have to do. Just make sure that you’re straight to the point as to why your child is absent, but also don’t forget to check for errors and that you keep the tone of the note as respectful as possible. You may also like free cornell notes. Your child’s complete name. When you’re writing down his/her name, you want to make sure that you write it completely (first name, last name, middle initial or middle name) and that there are no spelling mistakes. This is to prevent confusion among your child’s teachers and so that they can immediately identify the student. You may also see graduation thank you notes. The grade that your child is in and section. This information will help teachers in knowing which class the child belongs to. The name of the school that your child is enrolled in. Obviously, you want to write this down as the teachers will be wondering whether or not your child is actually enrolled in their school. The date in which you prepared the school note. The reason as to why your child will not be able to participate in his/her classes. Don’t get too much into the detail when explaining. All you have to make sure that it’s a valid excuse and one that your child’s teachers will be able to take in. You may also like sample thank you notes. Your complete name. The teachers will want to verify if you are indeed the parent of the child, so it’s best that you write down your complete name. Make sure that there are no errors. Your contact details. Teachers may just need to contact you to verify the situation, so be sure that you place your contact details without any mistakes in regards to the numbers. Your Signature. This is something that your child’s teachers are going to need to ensure that the note is from you and not something that was just made by your child. There are some teachers who won’t accept just a note to excuse your child for the absence. You may be required to provide other documents such as a medical certificate to prove that the reason you gave for the child’s absence is valid. So just provide whatever is asked from you and there should be no problems. If you would like to learn more in regards to how you should go about in creating a school note or anything related to this particular topic, then all you have to do is go through our site until you are able to find the articles that contain the information that should be able to help you out. You may also see Cornell note templates.